Although it’s difficult to fathom today, there was a time when computers were not a ubiquitous household appliance, and it took a certain kind of person with a particular set of intellectual abilities to understand, design, and program primitive devices that today would hardly be recognized as a computer. At that time, the word “hacker” did not carry the negative connotation that it does today, and instead referred to someone who simply enjoyed tinkering with electronics, logic devices, and as they became available, computers. A “hack” was a project that was innovative in some way, that was undertaken purely for it’s own sake, and that displayed a level of inginuity that would make it impressive to other hackers. In his first book, technology journalist Steven Levy explores the world of the early computer programmer, from the cutting-edge work being done in artificial intelligence at MIT from the late 50’s through the mid 70’s, to hardware hackers like Steve Wozniak who helped pioneer the home computer industry, and finally to early commercial game programmers who created games on machines like the Apple II and Atari 800. Discussed throughout the book is the “Hacker Ethic,” an ethos which states that people should have free and unlimited access to computers, that all information (including software) should be free, and that authority should never be trusted. 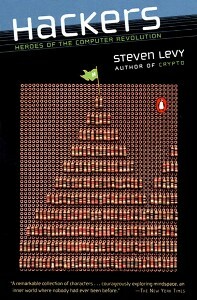 Far from a complete history of the computer, Hackers was written just as it was starting to enjoy mass appeal and as such provides a unique perspective as the computer transitioned itself from the ivory tower to the living room. The book is divided into three sections. The first section, called “True Hackers”, centers around the artificial intelligence lab at the Massachusetts Institute of Technology beginning in 1958. It was here that young college students were first given the opportunity to program the large hulking computers that existed at that time. Born in the AI lab at MIT were the first computer chess simulator and the first program to resemble a video game as we know it, Spacewar. The book goes into great deal about the hackers that existed at MIT, focusing not only on their work but also on that which drove them to program while in most cases eschewing a normal lifestyle. Interesting was the attitude among the hackers of “winners” and “losers”. “Winners” were those who could prove their worth as programmers and were thus accepted into the group, while those who did not immediately take to the machine and demonstrate their virtuosity were dubbed “losers” and shunned. Because of this, it was obvious that the MIT hackers had no interest in spreading technology far and wide, and were only interested in the purity of programming itself. In their own way, they were violating the hacker ethic by controlling access to computers. Although people should have access to them, once they had proved their ineptitude at truly understanding the computer they were pushed aside so as not to waste precious computer time that could be better utilized by one of the resident gurus. The primary theme of the second section, “Hardware Hackers”, is the power of the computer being brought to the people while the hacker ethic is still honored. While the computers at places like MIT were only really available to the geniuses who established themselves as virtuoso programmers, computer enthusiasts by the early to mid 1970’s could access computers through public terminals or could purchase early hobbyist computers like the MITS Altair. Focusing on the blossoming computer culture in California’s “Silicon Valley”, Levy goes into detail about the “Homebrew Computer Club” – an association of electronics enthusiasts, including Steve Wozniak, who would gather to trade ideas, information, and software, most of which was still free at that time. The hacker ethic was alive and well, and the culture in Silicon Valley was more decentralized and welcoming to anyone who wanted to take part. No longer did someone need to prove their worth; their enthusiasm was proof enough. Levy also discusses the first real threat to the future of the hacker ethic in the form of a letter sent by Microsoft founder Bill Gates to the bevy of Altair owners who had illegitimate copies of Microsoft’s very first product, Altair BASIC. In the letter, hackers were openly accused of theft, as Gates explained why in his view it was not possible for software to be free. The third section of the book will be of the most interest to the classic gamer. Titled “The Wizard and the Princess”, it follows Ken and Roberta Williams through the founding and early success of Sierra On-Line, publishers of such well-known franchises as King’s Quest, Leisure Suit Larry, and Quest for Glory. Much of the story centers around Ken, who was at one point a self-described hacker, and his changing attitudes towards the young hackers under his employ as he tries to run a multi-million dollar company. Although it is never explicitly stated by the author nor is any judgment about Ken Williams ever made, it’s obvious that a point is being made about Ken abandoning the hacker ethic in favor of monetary gain. Rather than focusing on it as a point of criticism about one individual however, Levy is using Williams as a microcosmic example of what was happening to the world of computers in the late 70’s and early 80’s, when it was becoming increasingly obvious that there were vast fortunes to be made. While the hacker ethic lived on (and still does today), it was incompatible with the mass appeal that computers began to enjoy and the money to be made as a result. Teenagers who at one time might have become the next great MIT hacker were now getting rich programming and selling the next great computer game. Along with Steven L. Kent’s “The Ultimate History of Video Games”, Hackers is a book that in my house never seems to be on the shelf because I’m always in the middle of re-reading it. Hackers is entertaining, informative and extremely well written and will appeal to anyone who enjoys tinkering with classic computers or just wants to learn more about their origin. While the history of the home computer is more commonly known, few are familiar with the early days of programming at places like MIT. As a fan of old computers and a collector of all things Apple II, it’s hard to read this book without wanting to pull out one of my old machines and start programming. Fortunately I lack both the skill and the tenacity of the individuals in the book, and can just stick to enjoying the fruits of their labor.